We started (and ended) with a very dreary, overcast, misting kind of day. Which, was good in that it blocks out the smell of crude oil that is slowly starting to premeate our air from the Oil Spill. Quail Creek was having its Annual Community Sale, so, as I had only an hour and a half, headed right out at 7am. Altogether, visited 17 sales. The common theme of the day was childrens toys, clothing and furniture, with a sideline of glassware. Seems these were prominent at almost every stop. 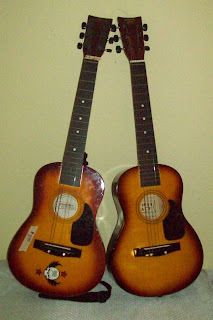 2 child size guitars ... these were just crying out to be designed, painted and loved without the involvement of little sticky fingers. 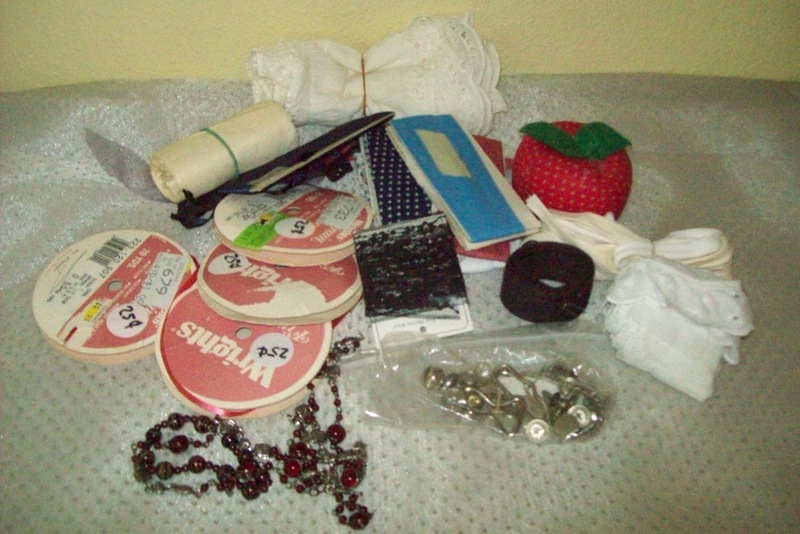 A grab bag of sewing things; some ribbons, bindings, a pincushion and a variety of little metal thingies. A necklace and bracelet with interesting beads and trinkets.